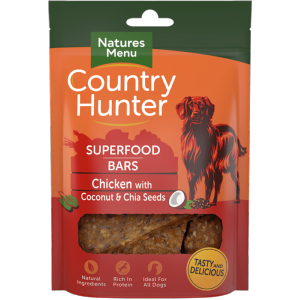 Country Hunter Superfood bars are made from delicious cuts of chicken with a mix of coconut and chia seeds. Finished with extra vegetables and fruits this treat is a tasty healthy option your dog will love. Ingredients: Chicken (65%), Pea Protein, Glycerine, Chia Seeds (4%), Distilled White Vinegar, Coconut (4%), Minerals, Dried Sweet Potato, Flaxseed, Dried Spinach (0.1%), Thyme, Vegetable Oil.